JR from the Korean boy group Nu’est recently had a birthday. According to SBS, fans rented out subway billboards with birthday wishes. JR wanted to go see the ads for himself and dressed up as Squirtle as he ventured out in public. 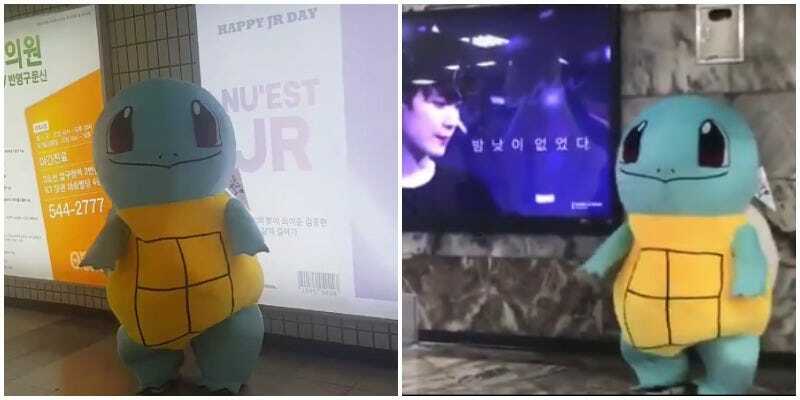 Below are images of JR, apparently dressed as Squirtle, checking out the birthday greetings. Doesn’t appear he was recognized and this one way he could see the birthday billboard without causing a scene.